Saturday’s results are a perfect example why it is mere folly to compile Derby lists starting in January. 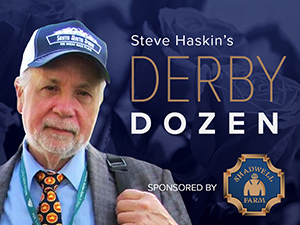 It’s OK for fun and people enjoy doing them and debating over them, but the Derby trail has changed so dramatically in recent years, many stakes results in January, February, and March prove for the most part to be meaningless come April and May. The only three horses in the Blue Grass field to have stamped themselves as Derby contenders with graded stakes wins or placings on dirt this year were Pleasant Prince, beaten a nose in the Florida Derby (gr. I); Odysseus, winner of the Tampa Bay Derby (gr. III); and Aikenite, third in the Fasig-Tipton Fountain of Youth Stakes (gr. II). Well, guess what? They occupied the bottom three places in the Blue Grass and lost all chance to make the Derby field. Get valuable insight into the pedigrees of this year's Triple Crown contenders with the special report package, Triple Crown 2010 Pedigree Profiles. Includes exclusive pedigree analyses, Past Performances, sire analysis by racetrack, & more! So, now, as in recent years, we have to go into the Derby wondering if a horse like Stately Victor is as good as he looked in the Blue Grass or if that race was another Polytrack fluke. One thing is for certain; he sure looked darn good, and if this race had been on dirt, he definitely would be considered by many as a legitimate threat to Eskendereya. He still may be, because of his class and stamina-laden pedigree and his visually impressive performance. And as you will see below, I am falling for it, while acknowledging I may be getting duped. Going into the Blue Grass he had failed to hit the board in three starts this year and was beaten a total of 15 lengths in his last two dirt starts. Oh, and getting away from Polytrack, did I mention that Arkansas Derby (gr. I) winner, Line of David, had never competed in a stakes, had never run on dirt, and had never earned more than an 88 Beyer Speed Figure? Perhaps someone can explain how he could blast to the lead, set wicked fractions, blow a three-length lead, and still hold off proven stakes horses Super Saver and Dublin? Is he, like, Stately Victor, a budding star to emerge out of the far reaches of the galaxy on the eve of the Derby? Darned if I know. What I do know is that for the third straight year, we could have a Derby winner that was a virtual unknown the first three months of the year. And I also know that one late closer I like an awful lot who looks good enough to upset the Derby or at least finish in the money likely won’t even make the starting field with $180,000 in graded earnings, and that is Setsuko, who believe it or not is #28 on the earnings list. This year, it will take $250,000 to make the Derby field; last year, it took $55,500. It has never taken more than $165,000 and that was considered very high. When the runners-up in Santa Anita Derby, Florida Derby, and Wood Memorial can’t get in the Kentucky Derby, something is wrong. Every prep race seems to separate him farther from the pack. Many are all but conceding him the Derby, as he appears capable of not only winning, but blowing the race wide open. Others want to see what he does with a fast pace and how he’ll react if he’s looked in the eye. The bottom line is that his victories have been on another level. He is still the solid second choice, although he goes about his business in a totally different manner than Eskendereya. He is the workmanlike, blue-collar type that will scratch and claw for everything he can get. And after all he’s been through he looks incapable of running a bad race. He needs to look Eskendereya in the eye at some point just to see what he’s made of. He actually started out at #1 back in December and remained in the top 3 before others replaced him. I was just looking for him to show he could run big while rating off the pace and he finally showed it. He did do a bit of drifting in the stretch, but he was probably getting tired, which was understandable considering the fast pace. The Arkansas Derby was only his second start and should move him forward and give him the tightness and toughness he’ll need for the big one. Crazy about his pedigree. His task in the Derby actually got more difficult thanks to his own stablemate, Line of David, who showed at Oaklawn you’re going to have to really motor early to outrun him. It’ll be interesting to see how Sadler deals with this situation. Both horses have terrific speed and can carry it; it’s not an ideal scenario for stablemates. OK, I admit it. I am opening myself up to look foolish once again, getting suckered in by another Polytrack fiasco. But, boy did this horse look impressive visually, and I love the way he was running through the wire, as if he was just getting started. And the outrider had to hustle to catch him galloping out. His pedigree is strong, he’s a big, good-looking colt, and I remember being very impressed with him in his first two career starts at Saratoga (one on dirt) before he faded into virtual obscurity. Maybe he has returned. His pedigree shouts late developer. If his losing a shoe at the start of the Wood Memorial compromised his chances, which it had to have done to some extent, then there is no reason why he shouldn’t rebound from a race in which he was supposed to “bounce” anyway. He likes running with cover and using his quick-fire acceleration, which will help him in the Derby. But his move has to be timed to perfection. Looked like he was home free in the Blue Grass, but battling on the lead and hitting the front so quickly didn’t help. I have no doubt he will love the dirt, the 10 furlongs, and will revert back to his old running style, coming from well off the pace. Only one horse won on the lead all day and the horse he was eyeballing finished last. His pedigree is as versatile as it gets. I just think he’s a very talented horse who is improving at the right time and could be a real sleeper. Cannot believe I like two horses coming off the Blue Grass, but I was impressed with what I saw and both look interesting. I need to have at least one late-closing dirt horse fairly high up, although it’s hard to tell just how good he is and whether he’ll be able to overcome the 6-week layoff. What a difference that nose meant between him and Pleasant Prince, who had to go seeking earnings over a surface he obviously didn’t like at Keeneland and now won’t make the Derby. He is yet another talented horse who seems to want to be near the lead, but he is improving so quickly it’s possible he can be effective from anywhere. He was always highly regarded by the WinStar team. He’s a handsome, muscular colt and I’m looking forward to seeing him train at Churchill. If he’s thriving physically and training impressively he’ll be one to keep an eye on. I can see moving him up closer to the top. Keeping him on here because of his talent and consistency, but his inability to win or quicken is a bit of a concern. He has shown he is more of a grinder who can sustain his run a long way, but he hasn’t been able to finish it off and pass horses in the stretch. But, as mentioned, you have to give him high marks for consistency. He comes at you every race. He will go into the Derby as a forgotten horse, because he’s not flashy and the Fair Grounds form has proven to be suspect. But the feeling here is that there is a lot more to him than people think. With his steady improvement, he could run a big race at a big price in the Derby. In the world of WinStar, I’ll give him a slight edge over Rule, but it’s going to be difficult for both of them with their early speed. Rule actually might be a bit more ratable, but I’ll take the 4 weeks over the 6 weeks, especially with a speed horse; you don’t want them too fresh. Tacking him on the end only because he did win the Arkansas Derby and showed a lot of courage holding off two top-class horses. But his pedigree is not really geared for 10 furlongs and he’ll have a lot more pace pressure in the Derby, mostly from his own stablemate, Sidney’s Candy.